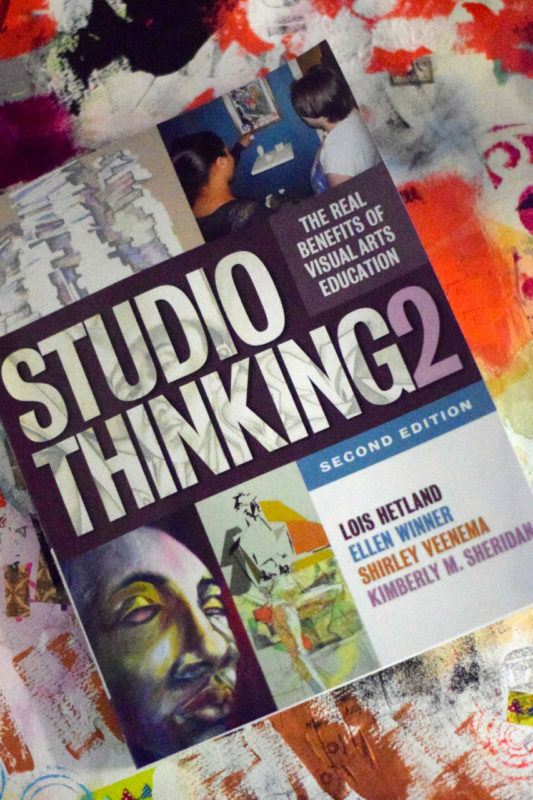 Lois Hetland, Ellen Winner, Shirley Veenema, and Kimberly M. Sheridan, Studio Thinking 2: The Real Benefits of Visual Arts Education (New York: Teachers College Press, 2013). The authors argue that visual arts education is valuable, not for the learning that transfers to traditionally core subjects, but for the type of thinking it encourages all by itself. Students learn things in visual arts classes that they don't always learn in other places at school. The first three structures share a chapter at the beginning of the book that outlines elements of each structure. A full chapter is devoted to Exhibition. At the end of the book, each structure gets an entire chapter to explore how to infuse the structure with the Studio Habits of Mind. Each Studio Habit of Mind gets its own chapter with examples of the habit in practice and development from real art classrooms. I'm not an art teacher, but I still found this book to be very useful. The four structures for learning can easily transfer into my Language Arts and Social Studies classroom. I often begin class with a demonstration/lecture that introduces and models the day's skill. Students-at-Work is similar to independent or group work time applying the skill. It may not be a sculpture or painting, but it might be categorizing primary and secondary sources or analyzing documents. Critique is something I'm working on with my students. We've started reflecting more in their interactive notebooks about what they learn, but there's potential to do more. Critique is an especially useful structure in the Language Arts classes as they craft essays and narratives. My Exhibition structure is usually pretty weak. At best, I display student work in the classroom or on a bulletin board in the hallway. Sometimes students help me staple things up, but they're not involved in any thoughtful planning or curating. Creating things with an audience in mind could be so powerful. My students could gather sources related to the 1918 Flu Epidemic in Brevig Mission and share them on a website. They could write letters to the editor of the regional newspaper. They could compile evidence to submit to the school board about why Brevig Mission needs a new school or more teachers or a bigger gym. Studio Thinking 2 inspired me to think of all the possibilities. I love the book's definition of a studio assignment. Studio assignments "specify or suggest the range of materials and tools to be used, and they pose one or more challenges that are open-ended and result in varied solutions" (page 17). I want my students engaged in these types of assignments! I don't want them to associate history with endless worksheets and powerpoint presentations. I want to teach them some skills and set them to work on meaningful things they can get excited about. The Studio Habits of Mind are good habits for life. They may be more important than most of the content I teach. Is it really important that my students know the year that World War I started? Is it important that they can recite the presidents of the United States in order? Maybe not, but it will matter if they can reflect on their own life and the results of their choices. It will matter if they persevere in the face of adversity, envision a better future, pay careful attention to the world around them, intentionally express emotions and messages, etc! Studio Thinking 2 also gave me great mental fodder for doing art projects in my history classes. I always connect the projects to content, but I could be doing more. I could connect each project to a Studio Habit of Mind to teach explicitly and encourage in my students. I may not use the example projects in Studio Thinking 2, but there was plenty in the book that made it worth reading and enjoying. *The Amazon links in this post are affiliate links. If you purchase through them, The Alaska Teacher receives a referral payment at no additional cost to you. Thanks for supporting The Alaska Teacher! Previous: First Day of Preschool!! !